Preheat oven to 350 degrees. Prepare 8X8 baking pan by lining with parchment paper or oiling well. In a large bowl, combine wet brownie ingredients (ghee through vanilla) and whisk until completely mixed. In a separate bowl, combine remaining ingredients except cherries and chocolate chips. Then add to the wet ingredients and mix until just incorporated. Stir in chocolate chips and cherries. Pour into prepared baking pan and bake for 30-35 minutes or until toothpick inserted into center comes out relatively clean. While the brownies are baking, prepare the ganache. Put all ingredients but chocolate chips into a blender and blend (alternatively, if you want a “chunky” ganache with cherry chunks, just stir everything together with a spoon. Pour this mixture and chocolate chips into a small saucepan and heat until sauce begins to bubble. Stir frequently for 5-10 minutes until this mixture starts to thicken and turn glossy. Remove from heat. Once brownies have cooled, spread ganache on top. These are extremely rich and moist. 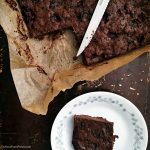 If you want a less moist brownie, you can try reducing the amount of coconut oil/ghee or upping the amount of almond flour – but I cannot guarantee good results since I haven’t tried to myself. These are VERY good after being left in the fridge overnight – they harden a bit because of the coconut oil, and the consistency is closer to fudge. Yes, you read that right. Needless to say it’s delicious either way.